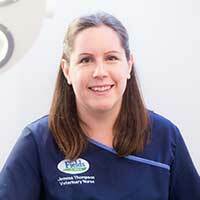 I have been working at Fields as a qualified Veterinary Nurse for nearly 10 years. I enjoy all aspects of my work including surgical nursing and reception. I have recently been away on maternity leave, and have returned to work part-time. At home I have a variety of pets including my two rescue cats, two rabbits and my Labrador Cross, Ruby.